I woke up this morning thinking it would be raining so I would go to the gym instead of run outside. It wasn’t raining but the wind was blowing around 25 mph, so I decided the gym it would be! Side note – if you are a runner, you know how annoying it can be to run on a windy day. Running against a strong wind is one of my biggest pet peeves. As I pulled out of garage to head to the gym, I noticed something was odd outside. It was oddly…. Dark. Like super dark. All of the street lights were off! What the heck?! It was creepy! So moral of the story – go with your gut feeling. Since I decided to go to the gym instead of run outside, I saved myself from having to run solo on some very dark streets! Now tomorrow morning they better have those babies back on for me, or the city will be getting a very angry call from me! As of today, I’m 10 days out from the Go! STL marathon. I’m getting excited! And also nervous. But it’s a good thing. My nervous energy helps me get lots of prep work done! Last night I cleaned, did laundry, made dinner, and even had some couch time afterwards! It was glorious and gave me some down time to send some emails. My Jazzercise ladies are awesome to help me out with my classes when I go out of town. I just have to remember to ask them first! So I’m a little more stress free today as I got all my classes for next weekend taken care of. Whew! I’m ready to go make some more awesome memories like this one! 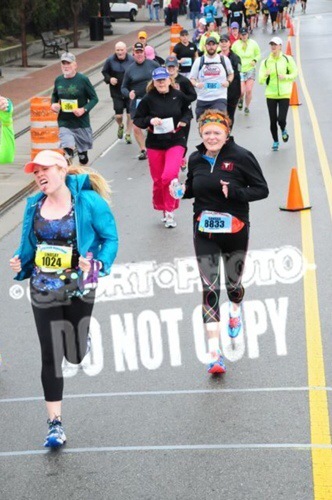 Haha I love how optimistic I was at the beginning of the Little Rock Marathon. I feel like I learned a lot at the race that will help me get through this upcoming one. 1. Don’t panic. And just keep running. No matter what. 3. You’re going to be emotional, and that’s okay. The stress of 26.2 miles makes it acceptable to cry multiple times on race day. 4. Remember to have fun! It’s actually possible to enjoy yourself during a good portion of a full marathon. I need to print this list and commit it to memory in case everything doesn’t run super smooth on race day. Something else I learned? Don’t drink too much coffee pre-race. And use the porta potties at the start line at least 2x before lining up. No more peeing at mile 2 for this girl!! Well it’s going to be another busy night. I’m teaching 2 classes to help out an instructor that is traveling for work this week. Then I just have to make it through work tomorrow and 1 more class tomorrow night before Saturday is here! And my momma is coming to see me and do some shopping! It’s going to be a good weekend. I’m also going to squeeze in one last long run of 10 miles to help ease my mind before the week of tapering and carbo loading begins!